04.30.2005 - I got these infant rats today. I'm working on a rat control job in Longwood, and I've got the whole home sealed. I've trapped two rats, but the customer said that she still heard noises coming from the bottom of one of the walls. I went to her home to inspect, and sure enough, I heard the very faint scratching coming from the bottom of the wall as well. I went up into the attic, but there was no way I could see down that wall void from the attic space. So I got my trusty drywall saw and cut a hole in the wall just above the scratching noise. There, at the bottom of the wall void, was a pile of shredded newspaper and some insulation. I'd uncovered a rat nest! I removed the baby rats, cleared out the nesting debris, sprayed the area, and fixed the hole I cut in the wall. 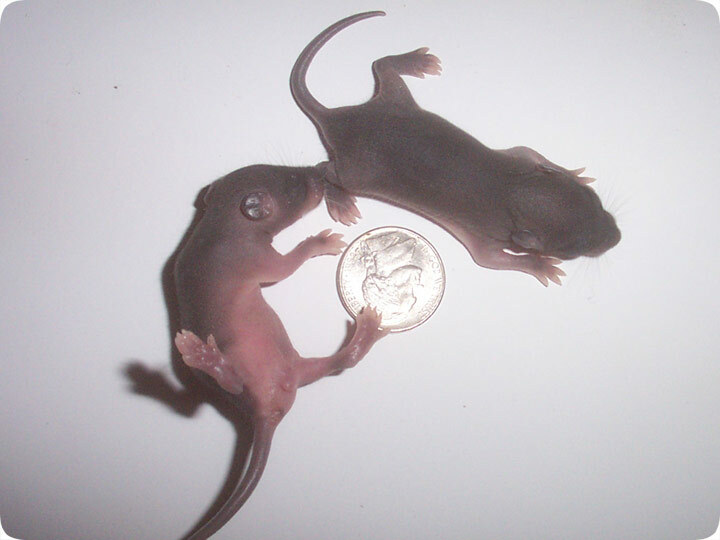 The above photo is of two infant Roof Rats (rattus rattus) which I guess are probably one, maybe two weeks old. I included a coin in the photo for size reference. Rats grow very quickly, so it's rare to see pinkies like this. They are sexually mature adults within just three months, at which point new rats like the ones shown above are made. Infant rats are, like many mammals, hairless and blind, but within just a few weeks, hair sprouts, the eyes open, and they're running about, chewing on wires and making noise in the night.